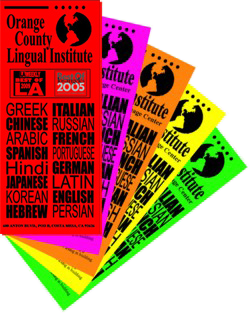 The Orange County Lingual Institute is the perfect place to learn a new language and start your journey down a path of new world experiences. We take pride in offering the highest educational experience and pay close attention to each important facet of learning. The Orange County Lingual Institute is Orange County’s premier language school offering an unparalleled and comprehensive schedule of Orange County French Classes, Orange County Italian Classes, Orange County Spanish Classes and language classes in 20 languages. The Orange County Lingual Institute is conveniently located near the South Coast Plaza in Orange County and has been in business since 2012. All scheduled classes are held at our beautiful facility located next to the Segerstrom Center for the Arts in Costa Mesa. Adults can learn a language (without gimmicks or false promises) at a very reasonable pace while enjoying life in Orange County, maintaining a job, and being involved in their family life. Just three major ingredients are needed: 1) an excellent teacher, 2) an excellent text, and 3) a class full of like-minded people. Success in learning a language here at the Orange County Lingual Institute can be achieved by attending an 80-minute class once a week, completing 15 minutes of homework each night, and being persistent. The classes include elements of laughter, fun and camaraderie, making it a weekly event people really look forward to attending. People are taught steadily; as they are inspired and motivated to continue, they keep at it and become more advanced in their skills. As students progress, they continue to attend increasingly advanced classes, where they review, practice, increase their vocabulary and their speed, and become more fluent. Learning a second language enriches the lives of the speakers and is an amazingly rewarding experience. Centrally located in Costa Mesa, our language classes are convenient for people living or working in Costa Mesa, Anaheim, Santa Ana, Irvine, Huntington Beach, Garden Grove, Orange, Fullerton, Mission Viejo, Westminster, Newport Beach, Buena Park, Lake Forest, Tustin, Yorba Linda, San Clemente, Laguna Niguel, La Habra, Fountain Valley, Placentia, Rancho Santa Margarita, Aliso Viejo, Cypress, Brea, Stanton, San Juan Capistrano, Dana Point, Laguna Hills, Seal Beach, Long Beach, and other communities in Orange County.